Carrier union boss: 550 jobs still leaving U.S.
President-elect Donald Trump lashed out Wednesday at a union leader who has criticized Trump's Carrier job deal as a promise "half-way delivered." But shortly after Jones appeared on CNN's "Erin Burnett Out Front" program Wednesday night, the president-elect appeared to blame union leaders like him for companies leaving the U.S. 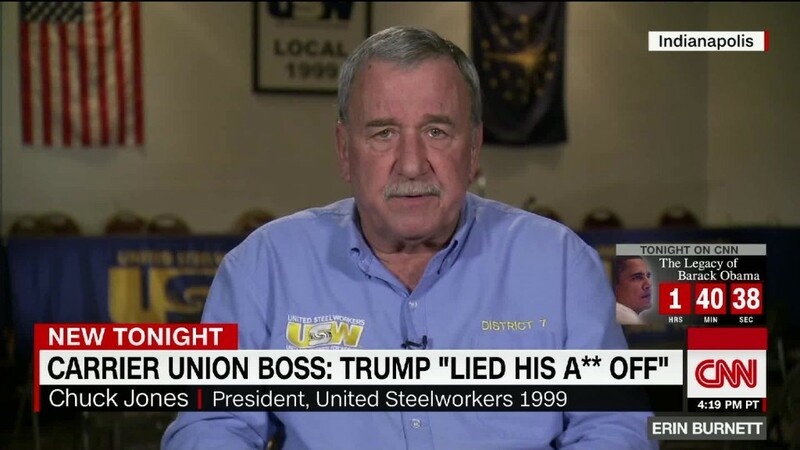 He followed up with another attack just over an hour later: "If United Steelworkers 1999 was any good, they would have kept those jobs in Indiana." Vice President-elect Mike Pence, who is also the governor of Indiana, gave a very different description of the union back in March. He tweeted a photo of a meeting he had about Carrier with Jones and Local 1999 members, calling them "hardworking."